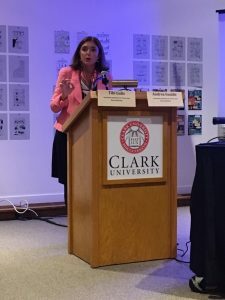 Ms. Andrea Gualde, Senior Adviser for Latin American Programs at the Auschwitz Institute for Peace and Reconciliation, delivered the keynote address at a recent academic conference hosted by Strassler Center for Holocaust and Genocide Studies at Clark University in Worcester, Massachusetts. The event, entitled “Emerging Expertise: Holding Accountability Accountable,” was held on April 6-9 and explored the concept of accountability as a theoretical concept, methodological concern, moral principle, legal demand, and form of ethical engagement from a variety of perspectives, with contributions from a diverse group of academics and practitioners. I belong to the generation who witnessed, with hope and joy, the reestablishment of democracy. At the same time, we experienced horror when we discovered the details of the extermination plan that was carried out by the dictatorship. We also experienced a constant fear over our future, due to threats posed to the new and fragile democracy. Having served as National Director of Legal Affairs within the Argentine Ministry of Justice’s Secretariat of Human Rights, Ms. Gualde discussed the work that her office embarked upon beginning in 2005, the year that the possibility of reopening legal proceedings against officials of the dictatorial regime was announced. During her tenure at the Secretariat, the government designed and implemented a program of reparations sensitive to the ongoing development of measures for truth, memory, and justice. I have no doubt about the pedagogical and didactic value of the trials in Argentina towards the construction of a new social contract that generates antibodies against institutional violence and defends democracy and the Rule of Law. Also speaking at the conference was Dr. Tibi Galis, the Executive Director of the Auschwitz Institute for Peace and Reconciliation and an alumnus of Clark University’s Strassler Center for Holocaust and Genocide Studies. Dr. Galis’ remarks focused on the work of the Auschwitz Institute, giving an overview of the organization’s initiatives including its regional programs in Latin America, Africa, and the United States, as well as the annual Global Raphael Lemkin Seminar for the Prevention of Genocide. More information, including the conference program, is available here on the Clark University website.